M u l l i g a n!! Imagine this. Bob, one of the biggest print buyers in town, meets with a salesperson named Ralph for the first time. They sit in a glass-walled conference room and chat. The meeting ends. Bob walks Ralph back to the reception desk; they shake hands, smile politely and Ralph leaves. On his way back to his office, Bob stops in the break room to grab a cup of coffee. He runs into his friend and co-worker, Mavis. While she works in another department, Bob had mentioned the meeting to her. Mavis also buys printing, but not as much as Bob. If Ralph heard this, he would cringe. He’d also be shocked. After politely listening to Bob’s pitch, he thought the meeting went fine. So what went wrong? It all came down to expectations. Bob met Ralph expecting a presentation that was helpful and meaningful, and it didn’t happen. At 34, Bob has been buying printing for more than a decade. Take a minute to scan his LinkedIn profile and you’ll uncover plenty of clues indicating that he is knowledgeable. In past and current job descriptions, he mentions “managing corporate communications” and “direct mail.” Look at the groups Bob has joined and you’ll see several that focus on printing and design. Ralph’s one-size-fits-all first meeting plan was a time-waster for Bob because it was far too simplistic for knowledgeable Bob. He rehashed information that Bob had discovered for himself when he looked at Ralph’s company online before the meeting. It just wasn’t tailored for Bob’s company or industry. When Bob meets with salespeople, he’s looking for two key ingredients to rate the meeting as satisfying: substance and utility. Recently, I attended a half-day training session on a topic that really interests me— Instagram advertising. The presenter was engaging and funny. Her well-designed presentation was easy on the eyes. In the four-hour session, I received about 30 minutes of substance and utility. This information was nice to know, but it wasn’t enough to “sell” the next session in the seminar series. Substance is about providing information with weight and meaning. Relative importance determines the amount of substance. For example, when someone tells you that tigers are the biggest species of the cat family and can travel at speeds between 30 and 40 mph, this might be interesting to know. But the relative importance is low. Now if someone tells you that you freeze or a tiger will pounce on you, this is very important to know. When you tell a buyer something substantial, he thinks about the information. When there is a practical use for the information, it provides utility. Meetings that offer both substance and utility satisfy buyers and feel like time well spent. Providing substance and utility starts with thinking about what the buyer is likely to know. For example, new buyers may be interested in learning more about how they can use strike-through varnish to create striking visual effects. If a seasoned print buying pro has used the technique many times, they will not care about basic how-to information. But the same sample, combined with a story about a fast turnaround in your multi-shift facility, holds their interest and gets the buyer thinking about how you would be the perfect fit for an upcoming brochure. Successful meetings start when you meet the buyer where they are regarding knowledge, experience and interests. For you to make a sale, the buyer must know certain information. What services does your company provide? Why are you qualified to provide these services? What makes you different—and better? What does the buyer want/need to know? How will you make sure the meeting provides enough substance and utility to give the buyer a positive feeling about the meeting? How will you convey information so the buyer genuinely enjoys the time they spend with you? When information has a high degree of substance and utility, buyers are more likely to retain it. They file it away in their brain, pulling it out when they are ready to purchase. For example, you share a useful tidbit about a new high-speed inkjet machine in your mailing department. The next day, a new mailing project lands on the buyer’s desk. Recalling the conversation, the buyer calls you about the project. In sales, we share a lot of information with prospects and customers. They retain some, but much less than we assume. 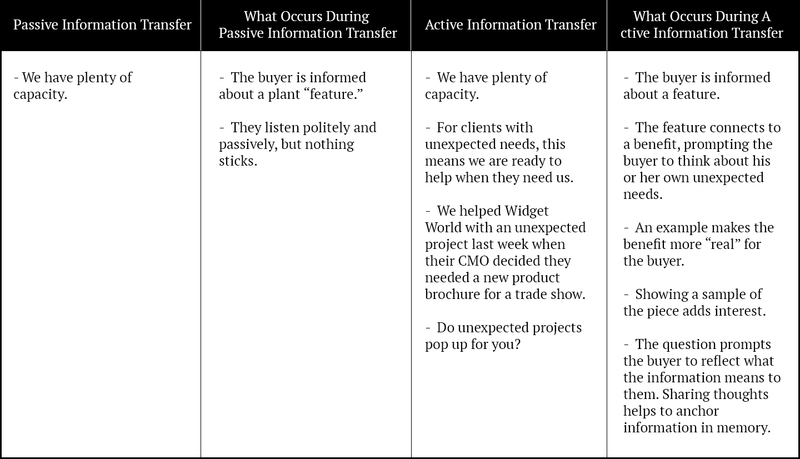 Information transfer can be passive or active. To increase retention, borrow the active information strategies used by professional educators in teaching situations. Teachers want you to do more than listen—they want you to think, evaluate information and consider its implications. To ensure learning is taking place, they ask for feedback and test for knowledge understanding and retention. Brian Tracy said, “Your life can only get better when you do something every day to improve your key skill areas.”Planning meetings with real value for buyers is a critical skill for sales professionals. Some buyers know a lot about your service. Others know very little. Take time to learn what you can about the buyer’s history and recognize they expect you to bring substance and utility. Boring buyers is a crime, even when your information is useful. Plan meetings to keep buyers engaged and entertained. Remember the old adage, “Telling isn’t selling.” Take a lesson from your best teachers. They used active information transfer techniques to aid learning and retention. Incorporate examples, samples, and questions to get the buyer thinking and to provide you with feedback on what they have learned. Getting a first meeting is challenging. To get a second meeting, the buyer must walk away with enough substance and utility so that they believe the time they spent with you was worthwhile.